A. 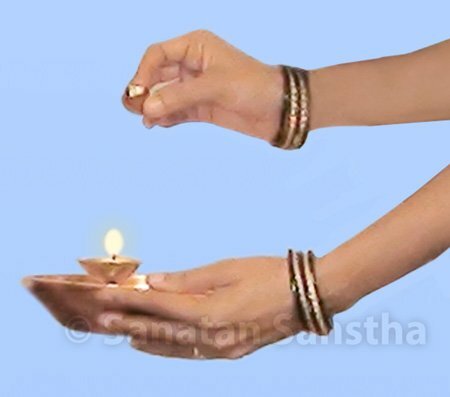 The spiritual meaning of ‘Aukshan’ : ‘Aukshan’, the ritual of waving lit lamp means, welcoming of the divine frequencies brought on the earth with the help of the lit lamp, and surrendering to those frequencies at the same moment. Development of an armour: While waving the lit lamp around the embodied soul the frequencies projected and imbibed by the soul, create an active armour around the body of the embodied soul. C. For whom is the ritual of waving lit lamp performed? : The ritual of waving lit lamp is performed on young ones, elders, respectable individuals, King, Soldier embarking on a battle and Saint. D. Where is the ritual of waving lit lamp performed? 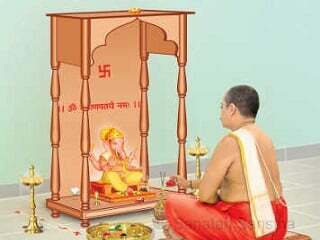 : Generally the person is made to sit in front of the Deity at home, while performing the ritual of waving the lit lamp. During some specific occasions (for e.g., thread ceremony, marriage) it is performed at the venue of the ceremony. Why is the ritual of waving lit lamp performed inside the home and not while standing at the door? 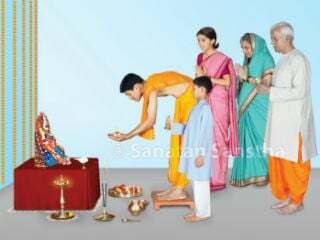 Articles required for the ritual of waving lit lamp : Turmeric powder, kumkum (vermilion), unbroken rice grains (akshata), cotton wicks, oil, lamp, gold ring, whole beetle nut etc. In the dish, on our left, the turmeric powder and vermilion is placed as symbolic of the Aadishakti (primal energy) required for any action. The subtle fragrance emitted from the turmeric powder and vermilion attracts the divine sutble particles (pavitrake)of the Deities present in the universe. As the unbroken rice grains are of all-encompassing attribute, they are kept in the center of the dish. Just in front yet closer to the unbroken rice grains, the lit lamp is centrally placed. The lit lamp denotes the central channel activated by the energy of the embodied soul. When the primal energy received through the vermilion and turmeric joins the divine male principle received through the gold ring and beetlenut, the blessing flowing from the Deity through the medium of the unbroken rice are transmitted towards the embodied soul. This activated central channel in the jiv, thus brings success in the mission, with the divine grace. This correct arrangement of the articles in the platter, help in gaining of the divine principle by the embodied soul. 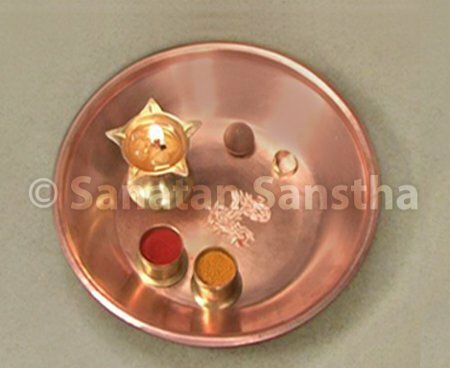 Question : When arranging the platter for the ritual of waving lit lamp, the turmeric and vermilion is to be kept of the left hand side. On the other hand in the platter arrangement for ritualistic worship (puja), the turmeric and vermilion is placed on the right hand side. How can one bridge the seeming discrepancy? 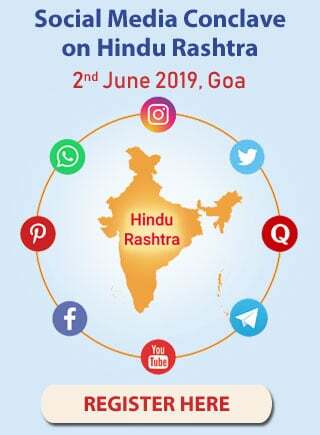 Answer : The arrangement of the articles in the platter for ritualistic worship is done, so that the respective Divine principle gets attracted and the place of worship gets purified. The ingredients are included for their inherent color and fragrance. Amongst these items, vermilion and turmeric, have maximum ability to attract the active and raja predominant manifest principle so they are placed on the right hand side of jiv. In the platter used for the ritual of waving lit lamp, the gold ring and betelnut is included. These have more ability to attract the raja attribute at an inferior level as compared to turmeric and vermilion, thus they are placed on the right hand side and the turmeric and vermilion is shifted to the left hand side. 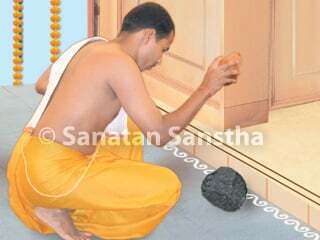 Thus the placement is done as per the kind of raja attribute required for the ritual. Keep a wooden stool and draw a design with rice powder (rangoli) around it. Let the one on whom the ritual is done, be seated on this stool. Wet vermilion is applied on the forehead of the individual undergoing the ritual, with upward movement using the tip of the middle finger. 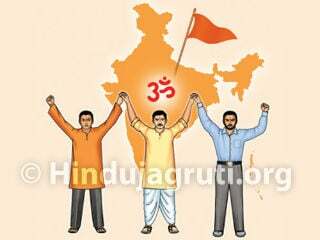 Then few akshatas are placed on the vermillion. Then with the platter in hand, the gold ring and the beetlenut is held together and waved around the face in following manner. B. Then wave the ring and beetlenut from the right shoulder, in a clockwise direction to the left shoulder. Then repeat the process but in opposite direction that is waving from left to right shoulder. Repeat thus thrice. Everytime one should touch the ring and beetlenut to platter. Then the individual undergoing ritual should be waved with the whole platter. The one who waves the lamp then prays for the betterment of the individual. While keeping the platter down akshatas are placed underneath it. Why inauguration ceremony should be done by breaking a coconut ?